Ideas are Physical: Where Were We Now? "Curiouser and curiouser!" cried Alice. - from Alice's Adventures in Wonderland, by Lewis Carroll (1865). 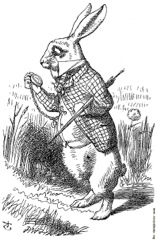 Perhaps you are thinking to yourself, 'long about now, that Lewis Carroll's white rabbit - holding a timepiece and wearing a waistcoat, no less - doesn't look to be all that great a fit with Thomas Nagel's bat. "c emerson," you may want to be saying, "Some time ago you asked me what it would be like to be a bat, a live bat. You didn't ask me anything about what it would be like to be a fictional character - a rabbit holding a timepiece and wearing a waistcoat, no less - that appeared in some fairy tale written one hundred forty-eight years ago." Well, I might just want to answer you this way, "Things just keep gettin' 'curiouser and curiouser' when we try to figure out who we are, and what we are made of." Mirrors or no mirrors. "We all have a history, don't we?" is the way I just might continue, if I had a mind to continue, which I do. "And like my title, 'Where Were We Now?' 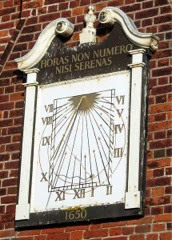 - Time, with a capital 'T,' is a factor, too, in who we are. A pocket watch, for a waistcoat, is just like an ancient stone timepiece, only easier to carry. You'd agree with that, wouldn't you, that time is part of who we are?" Alice gave a weary sigh. "I think you might do something better with the time," she said, "than wasting it in asking riddles that have no answers." Now Lewis Carroll, whose 'real' name was Charles Lutwidge Dodgson, was born and raised in Cheshire County, England, bordering Wales. The Mersey River flows through the County. Charles, aka Lewis, was born into a family tree filled with Anglican clerics, until the boughs were breaking, so to speak. Isn't that the way it is for everyone in England? And didn't Gerry and the Pacemakers sing a song about ferrying across the Mersey? 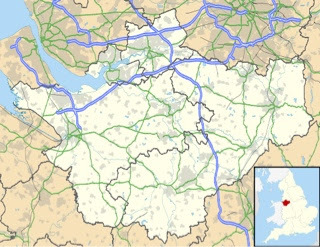 Did you see how I worked another time image (pacemaker) and a place name (River Mersey), right into the story about who Charles Dodgson 'really' was? Dodgson, aka Carroll, spent his professional career as a Lecturer in Mathematics at Christ Church, Oxford. While his modern fame centers on his fictional characters, particularly Alice and the White Rabbit (but don't forget the Queen, King and Jack of Hearts), Dodgson, without his pen name, published a significant number of other books, including ones in the study of logic and mathematics. His books, The Game of Logic and Symbolic Logic, are still worth the read today, in me 'umble opinion. Didn't know all that, did 'cha? Well, it's a mug's game, if Knave ye be. And a Queen's game, if you like this sort of thing. "Please would you tell me," said Alice, a little timidly, "why your cat grins like that?" "It's a Cheshire-Cat," said the Duchess, "and that's why." ""I didn't know that Cheshire-Cats always grinned; in fact, I didn't know that cats could grin," said Alice. "You don't know much," said the Duchess, "and that's a fact." 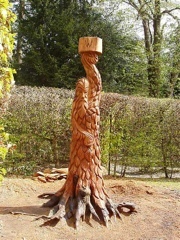 If all these metaphors, icons and symbols strike no chords with "you" -- that is, with your own deep-seated Self -- then let me clarify a bit more; nay, let me make it as clear as day; just like the tree carving here of 'Greenman,' who stands at the center of the Tatton Park Maze in Cheshire, hoisting a compass for lost travelers to survey, on land that Lewis Carroll may have walked on: here and now, in our search for an understanding of our Selves, we (meaning I, unless you join in this journey with me) have now added a Where and When to what was already a What and Who. We -- you and I and they and those and others like them and those and us -- all seem to exist somewhere, within our own bodies or within our own minds, and at some place and some time. But exactly where is there? It seemed so peaceful, on the river. Then Alice went to sleep, and the Sweep of Time changed everything, and the White Rabbit rushed by, through the recesses of her mind. "Dear, dear! How queer everything is to-day! And yesterday things went on just as usual. Was I the same when I got up this morning? but if I'm not the same, the next question is, 'Who in the world am I?' Ah, that's the great puzzle." 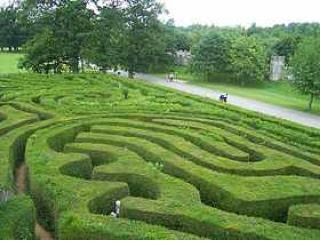 - queried Alice, just a fictional character, lost in a maze down some rabbit hole. YES, EXACTLY: who are we? And WHERE SHALL WE GO? In the midst of war-torn America, in a world where up seems to be down, where neighbor wants to hate neighbor, and the axe is ready to fall, "go ask Alice, when she's ten feet tall." When the clock strikes midnight, but won't show a pattern on the wall, and "the men on the chessboard", are all telling "you where to go", then "go ask Alice, I think she'll know." That, at least some of it, from the Jefferson Airplane (1967), mixed with a number of my own eclectic phrases (which J.A. might well reject), seems to portend some pretty sage advice, if we only knew what it meant. Like being a bat, in some specific place and at some specific time, somewhere out here on planet Earth, or just in the back of your own mind. ... if you drink from a bottle marked "poison," it is almost certain to disagree with you, sooner or later. Now where did that bat go? UPDATE: This post was moved from (4/23/13) along with any comments. Note that this post's title and Blogspot URL will no longer match, but the title here is correct. - lyrics (quoted and then interspersed with non-lyrics) from song, White Rabbit, by Jefferson Airplane (1967); thanks Brad, I was trying to figure out how to tie this together. - Earth Day was yesterday, the day I intended to post this piece; uploading delays changed my plans; my, where does the time go? Let's do whatever it takes to save the planet, even scurry down a rabbit hole if need be. It may cost me a vote or two, but check out my post, "Bicycles Will Cost Less" on my other blog, Random Walk way back in 2008; the time is getting late, and the Queen won't wait: it'll be "off with our heads" if we aren't careful. And by the way, I'm not running for anything. - 'Greenman', Tatton Park Maze, Cheshire, England, courtesy of Tim Burgess, sculpted by Tim Burgess, Rosterne, Cheshire, England, at http://thetimburgess.typepad.com/ and http://thetimburgess.typepad.com/photos/just_ordinary_carvings/p4290008.html ("The plinth on the top has the four corners of the compass marked upon it ... there are 244 leaves on the tree -- which is the number of steps it takes to get from the Maze entrance to the tree ... I think this tree has real spirit, maybe it is in his eyes ... I feel he is a bringer of luck and good fortune"). 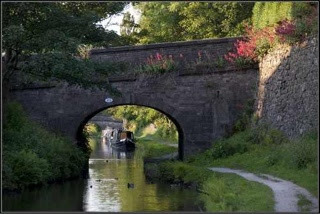 - Macclesfield Canal, Macclesfield, Cheshire, England, photograph by Patrick Hogan, courtesy of Pictures of England at http://www.picturesofengland.com/England/Cheshire/Macclesfield/pictures/1136652/link (all rights reserved; not for commercial use). Sure, all done setting the pics and re-arranging the defense. Have you been waiting? Like a caterpillar smoking a hookah. Thanks for the credit. Great catch with the Greenman! 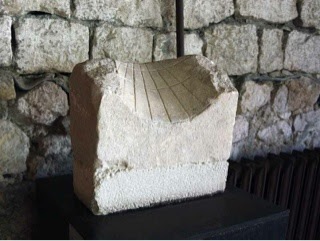 And the ancient sun dial. This is the craziest philosophy book I ever saw. But good show, and all that. You know you missed a Dylan op. "There's something funny going on," he said, "I can just feel it in the air." There was no actor anywhere better than the Jack of Hearts. -- Lily, Rosemary and the Jack of Hearts (1974). -- the only difference between Carroll's Knave of Hearts and Dylan's Jack is ... the Knave gave back the tarts. -- so what's the moral in that? Alrighty then. Holy Cow, Batman, I just saw a bat, and it flew right into the rabbit hole. Must go to work, at a given time and place, but that's just me talking, or I think it was me. Great post C.E.! I had never contemplated Alice In Wonderland as being a philosophical "riddle," but it really is. Thanks for pointing that out. ... "if you drink from a bottle marked "poison," it is almost certain to disagree with you, sooner or later." I can see the Bible being a metaphor in that quote...except the ancient authors forgot to mark it "poison." The loss of Self in a rabbit hole, and the mystery of change to Self on a daily basis - is present to us all. Saw you on Oerter's blog. This looks interesting. I assume you will post more about Nagel's concepts? Con bạn đang bị suy dinh dưỡng hả,bài viết này chia sẻ hay nè:tre so sinh bi suy dinh duong.tinh hoan ben to ben nho co sao khong?bạn thắc mắc nhưng không biết hỏi ai.Bài viết sao đây sẻ chia sẻ cho bạn hiểu rỏ hơn về tinh hoan ben to ben nho.Muốn tìm hiểu thêm click http://lamthenaodecoduoc.blogspot.com/. Looking in a mirror, who do you see?